On our last trip to Disney we arrived in Orlando by 11am, and headed straight to Disney’s Hollywood Studios. We had reservations for a late lunch at the Brown Derby, but since our day started at 5am, we were completely famished and just couldn’t wait to eat. 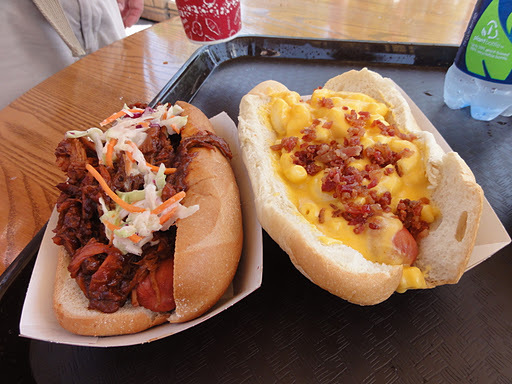 So on our walk over to the Tower of Terror and Rock ‘n’ Roller Coaster, we stopped at Fairfax Fare to try the new Gourmet Hot Dogs that we’d been reading about on the Disney Food Blog. We ordered the Truffle Mac and Cheese with Bacon, and the BBQ Slaw dogs. Both dogs were HUGE, but at $8.19 each, even with chips included, incredibly overpriced. There is also a Burrito dog, which comes in a wrap with lettuce, tomato, cheese, jalepenos, and sour cream. There are only three of us after all, and so we decided to share two. First, the BBQ dog. Mr. MouseChow liked this one quite a bit. I found it the more palatable of the two. The BBQ sauce was way too sweet for my taste, but made slightly less cloying by the slaw. The hot dog itself was fine, but more of a delivery vehicle for the other ingredients than anything. I wouldn’t get it again. The Mac & Cheese dog was just plain yucky. The M&C itself was gluey, starchy, and salty, much like the stuff you can buy pre-made in a tub in the grocery store. If there was any actual truffle oil present I wasn’t able to detect it. And believe me, I’m like a French pig when it comes to sniffing out truffles. To add to the horror, it was then sprinkled liberally with bacon bits. Normally, bacon is a welcome addition to most foods. Not so here. However, our ten-year-old, Minnie MouseChow, loved it. Go figure. So have you tried these, yet? Plan to next time you visit? 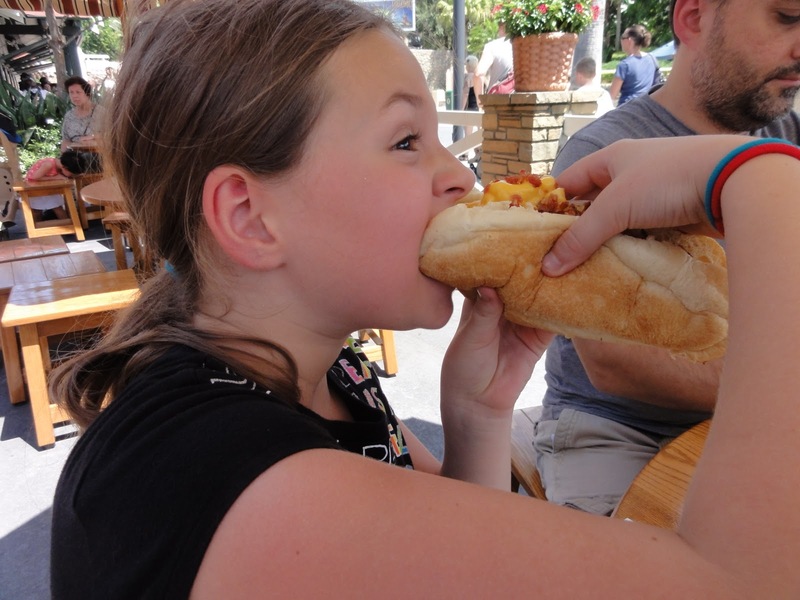 Any opinion on the Burrito dog? Let us know in the comments!